This post contains Amazon links. If you click on the link and make a purchase, I may receive a tiny commission. I received an ARC of this book for review consideration from the publisher. Josh Malerman seems to be interested in the horrors our senses can visit upon us and not in any light way. Both of his works, thrillers that verge on being horror novels tease the concepts of what would happen if something could threaten us so completely through one of our senses. By exploring this idea, other philosophical questions gain entry even as we rapidly turn the pages to find out what happens next. In Bird Box, the horror was what our eyes would see and once seen, could never be unseen. In his latest, Black Mad Wheel, he turns the spotlight on our hearing. This is not only a thriller/horror but also a work of historical fiction! It takes place about 13 years after the conclusion of World War 2. A small group of men who served in the military during the War have started a band. Their history and their musical talents make them attractive to the military who feel they have discovered a brand new weapon. This weapon seems to render all other weapons useless and makes men sick. It's in the deserts of Africa and they need someone to go and locate its exact source. Like with Bird Box, Malerman alternates between the present and WHAT HAPPENED in order to build a suspense and a deep desire to know what happened. I enjoyed this book and once I had time to read I read it one day. It was a fast read but it does venture into philosophical questions or originy type questions so there's some depth. I don't think it's as effective a novel as Bird Box or as enjoyable overall, but comparison isn't always helpful as I did enjoy the book overall. There are some definite science fiction aspects to it. it's not real world grounded but it is interesting. 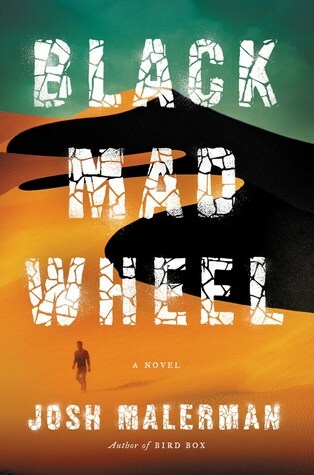 It's hard to imagine a sound so terrible it's a weapon itself, but that's what the characters face in Black Mad Wheel.